Danielle Della Torre is staying local for college. Torre is from Watkinsville, Georgia and swims for Athens Bulldog Swim Club. She’ll be a University of Georgia Bulldog in the fall. The high school senior attends Oconee County. At the 2016 Georgia 1-5A High School State Meet, she split a 28.85 on the breaststroke leg of the school’s seventh place relay. In 23.18 she anchored the team to a sixth place finish in the 200 freestyle relay. Individually, Della Torre won the 200 IM in 2:01.01 and the 100 breaststroke in 1:02.38, both by narrow margins. Della Torre swam the 200 IM at Olympic Trials this summer. With that experience under her belt she could make an impact at the Southeastern Conference Championships. In the 100 breaststroke her best time would have made her a C finalist. 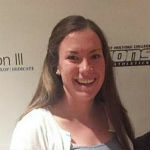 She will also join an IM group that includes Meaghan Raab and Megan Kingsley.